Say "I do" at a wedding chapel in Niagara! 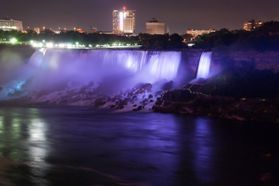 It's the Honeymoon Capital and whether you are looking to elope, have a small wedding or renew your vows, there is nothing like the energy and excitement of getting married in Niagara Falls! Couples come from all over the world to celebrate their love and take part in the fun of the area. Rev Deb can assist with a lovely wedding at a chapel in the heart of the action. It is your wedding, your way, every step of the way. You and up to 20 guests can enjoy your celebration at a wedding chapel on Lundy's Lane. You have a 45 minute period in which to arrive, have the wedding and take photographs. Your fee includes pre-wedding consultation, Deb's services as officiant, the venue, personalized ceremony, and time for photos. Upon receiving your deposit or payment, the basic ceremony is sent along to you via email along with directions to the Chapel. Once you have a chance to review the material, there is a phone or email consultation with Deb to personalize it to your wishes. All details will be finalized before the Big Day. PLEASE NOTE: If you have been divorced outside of Canada, there is an important step before you are eligible for a wedding license. Please visit the FAQ page for more information on this. You'll need an Ontario wedding license. For information on where to obtain one, please refer to the FAQ page. And the rings, camera, etc. Please arrive five or ten minutes before your appointed time. There are lots of parking spaces, as the chapel is part of a motel. Please arrive wedding ready. There is a washroom available for your use but there isn't a change room. Flowers - If you are not planning on bringing flowers, we can lend you some lovely silk flowers for the Bride and Maid of Honor for the occasion. If couples are more than 20 minutes late there is a late fee of $35. a $35 non-payment fee added to the balance owed. Your wedding must be prepaid (a $100 deposit is fine) and prebooked. We accept e-transfers to holyangels@sympatico.ca, credit cards over the phone (3% processing fee) or online through Paypal at the buttons below (3% processing applies) We pay the tax! Upon the receipt of your paypal payment or electronic money transfer, your requested date and time will be confirmed via email. Payments are non-refundable. The balance must be paid by phone, e-transfer or Paypal before the ceremony or in cash the day of the wedding.